Clearly too advanced to have been made by human hands! Tiwanaku (also spelled Tihuanaco or Tiahuanacu) is a Pre-Columbian archaeological site located in the Andes Mountains, in Bolivia. The Tiwanaku culture is a precursor to the Inca Empire, and is notable for its remarkable stonemasonry, architecture and sculpture. Little is known about the people who built Tiwanaku since they had no known written language. Sadly, Tiwanaku, much like the Giza Pyramids, the Sphinx and Easter Island, has attracted its own share of woo and pseudoarchaeological nonsense. Most of the claims made by alternative historians and pseudoarchaeologists revolve around the dating of Tiwanaku, the advanced stonemasonry displayed in its construction and its apparent "cataclysmic destruction". Many of these claims did not originate overnight and can be traced back to a man named Arthur Posnansky, an engineer and amateur archaeologist who visited the site and did some research on it during the 1940s. Since those were in the days before carbon dating, the well-meaning but misguided Posnansky attempted to date Tiwanaku using astronomy and came up with a startling result: the city had been constructed in 12 000 BC! He also described the ruins of Tiwanaku as bearing the traces of a great cataclysm, which he concluded was how the city had been destroyed and abandoned. However, Posnansky's more extraordinary claims about Tiwanaku such as the date and its cataclysmic destruction were later discredited and abandoned by mainstream archaeology. Well, the dating was done before the discovery of carbon dating. The site was later dated using that technique, and, in combination with proper archaeological digs, it was found that the site's current megaliths and sculptures were only added to the site in the period between AD 300 and AD 1000 (although the site itself is estimated to have been inhabited as far back as 1500 BC by small peasant communities). The signs of a cataclysm observed by Posnansky can be attributed to a far less exciting source than a world-wide flood or nuclear war brought about by aliens or Atlanteans: good old fashioned vandalism (by human beings, that is, not aliens or Lemurians!) During the colonial period, many of Tiwanaku's sculptures were defaced, moved or destroyed by the Spanish, and the site was also quarried to a great extent by locals who used the blocks for their houses. The site was also used as a source of stone during the construction of a railway (some sculptures and walls were even dynamited by the construction workers), and many blocks were moved and dumped unceremoniously in piles far from their original location. The building techniques used at Tiwanaku are far too advanced for those stupid, primitive South Americans, therefore, beings from outer space taught them how to do it all. The blocks are so heavy that the local savages couldn't have moved them without anti-gravitational technology! Therefore, aliensdidit. 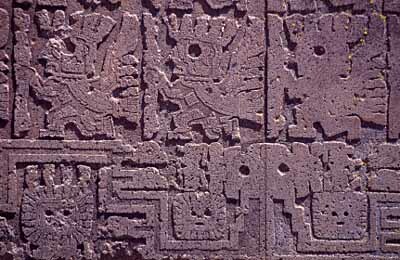 Posnansky's dating of Tiwanaku places the city well before any kind of civilisation existed; therefore, aliens came down from the stars and taught the locals everything. Tiwanaku shows all the signs of having been destroyed by a great cataclysm; therefore, aliens dropped nuclear bombs on it/used a death ray etc. Elephants are clearly visible in some of the carvings. Elephants aren't native to South America, therefore aliens brought them there to make a giant petting zoo. Note that much of the so-called evidence listed above has been explained with other, more earthly causes and also includes a good dose of racism. Atlantologists also use the exact same "evidence" as the alien enthusiasts, but replace the benevolent aliens from Alpha Centauri with equally benevolent (or patronising, depending on your point of view) refugees from Atlantis. People such as Graham Hancock have also rejected the criticism from the scientific community by claiming that there could be ANOTHER, OLDER Tiwanaku beneath the one we know. So, y'know, grab your shovels and start digging and you might find Atlantis! ↑ 10 Amazing Discoveries That Will Won’t Make You Question Everything (Chapter 11: fish, elephants and Toxodon) from Keith Fitzpatrick-Matthews at Bad Archaeology, January 14, 2014; and here is where you can see the "elephant"
This page was last modified on 2 November 2018, at 08:55.